I watched a fantastic documentary last night on the BBC iPlayer by Bob Harris. The film followed rock gods, Queen on tour in 1977 and celebrated the 40th anniversary of the album, News of the World. The film was candid. It was a real treat to see the band in the studio recording hits from the album such as We Are The Champions and My Melancholy Blues. It reminded me of just how raw the album is – especially considering that it follows A Night at the Opera and A Day At The Races. It was interesting to see the band being human, their guards down – Freddie playing the drums during sound checks, having fun with each other and telling each other to f**k off – all very human and quite frankly, all very normal. Delightful. The film served to re-enforce my belief that Queen still continue to be the best stadium rock band that ever walked the earth and I for one will be rushing out today to buy a new copy of the album! The film is still available (correct at the time this article was published) on the iPlayer. Go and check it out! 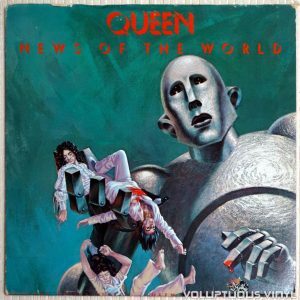 News of the World is the sixth studio album by the British rock band Queen, released on 28 October 1977 by EMI Records in the United Kingdom and by Elektra Records in the United States. It went 4x platinum in the United States, and achieved high certifications around the world, selling over 6 million copies. Wikipedia.